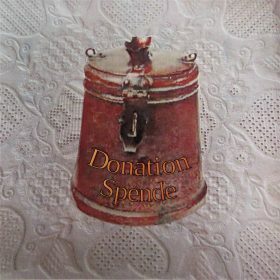 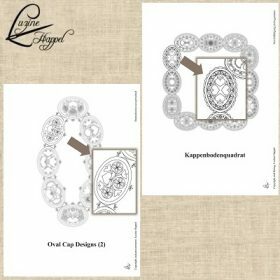 Some time ago I had the opportunity to purchase many old traditional templates from the last Schwalm template maker, Ludwig Schmerer. 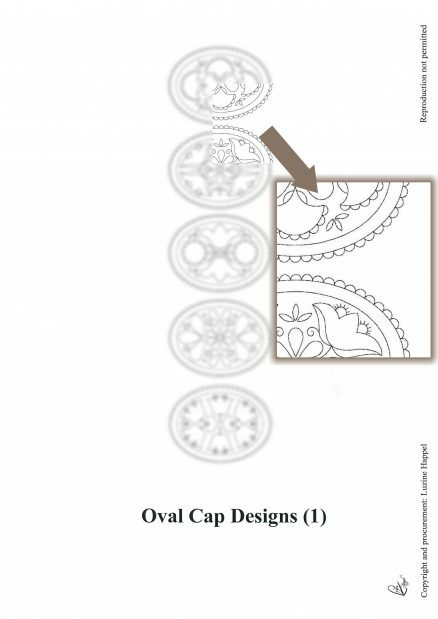 Among these templates were some for the bottoms of the caps. 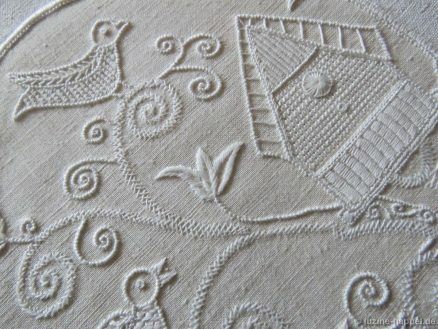 I enthusiastically looked for a contemporary use for the patterns. 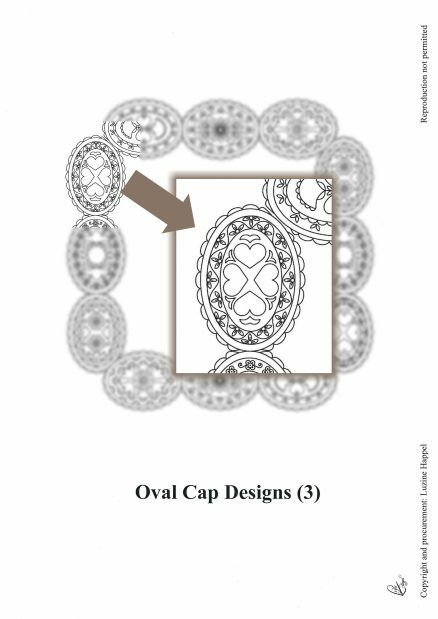 The oval shape of the cap bottom templates brought forth the idea to create Easter eggs. 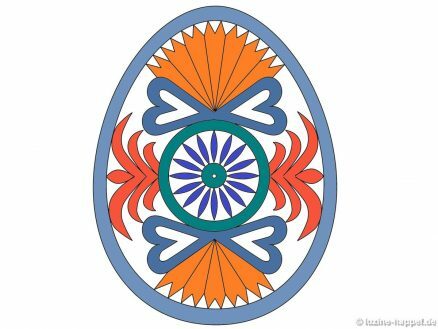 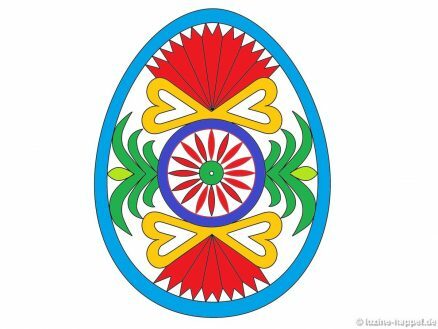 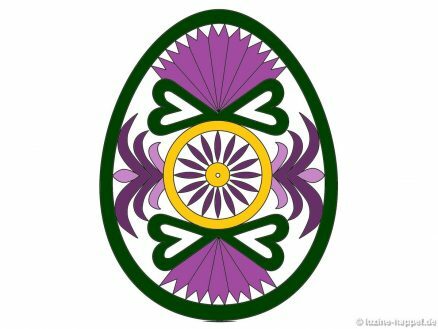 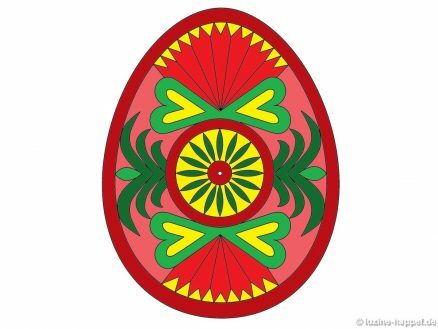 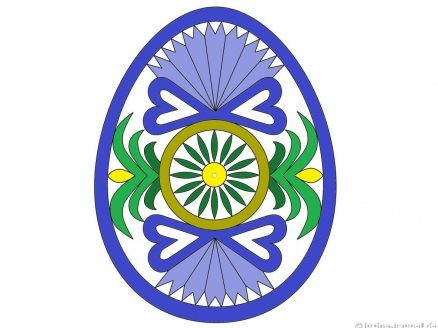 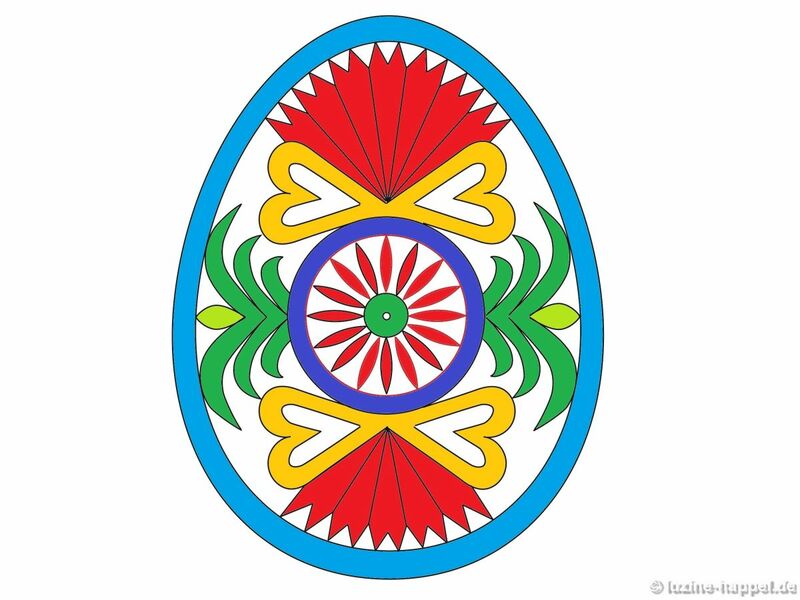 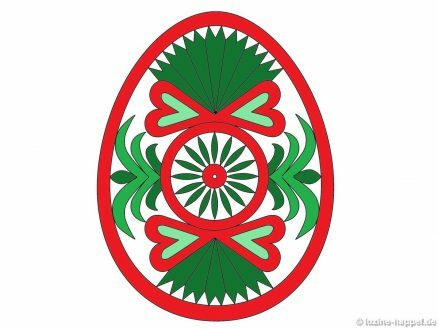 My graphic designer transferred the oval to an egg shape and created ten richly diverse drawings. 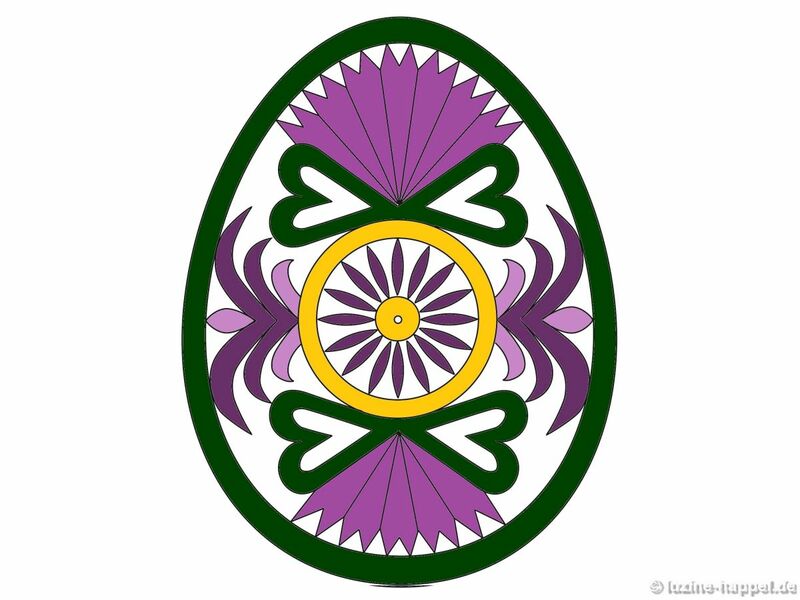 I present the first of these this year. 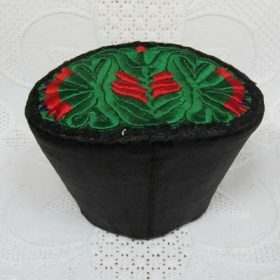 Unfortunately, I do not have in my collection an original cap with this exact pattern, but I do have a couple of caps with parts of the same design. 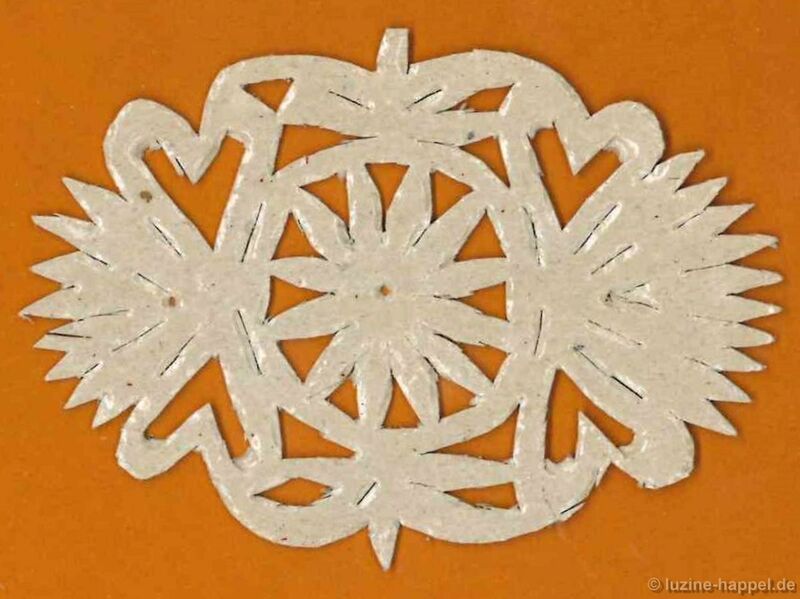 and sometimes also include gold and silver bullion. 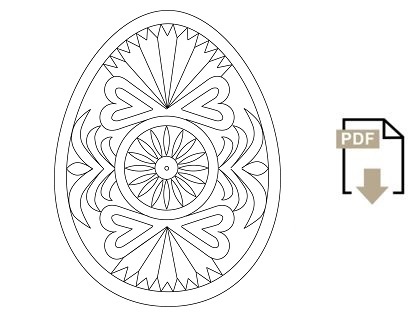 In the past, to achieve a precise rendering of the single pattern segments, a special paperboard was inserted. 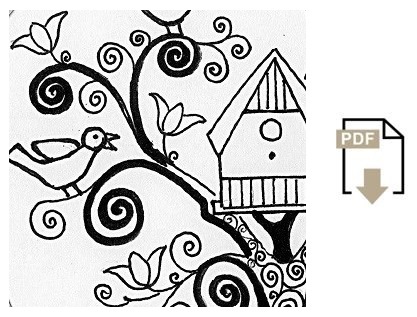 Unfortunately, I had neither a matching template nor the tools to make such a template. 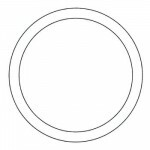 So I looked for alternatives. but, unfortunately, it is unsuitable because the thread gets lost in the soft material, and the edges end up looking jagged. 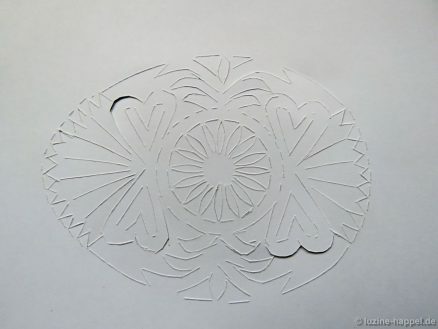 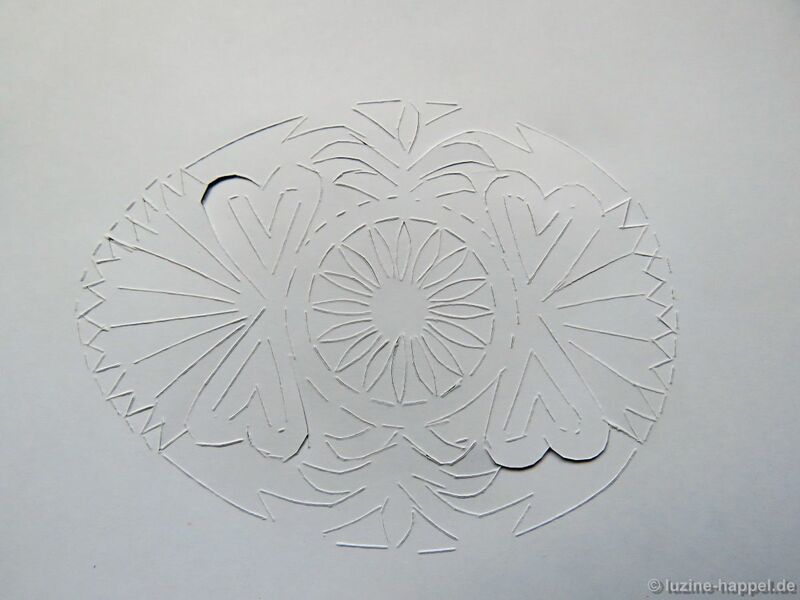 For my second attempt, I made a template using a craft knife and thick paper (image below: back side). After cutting out the template, I basted it to the fabric. 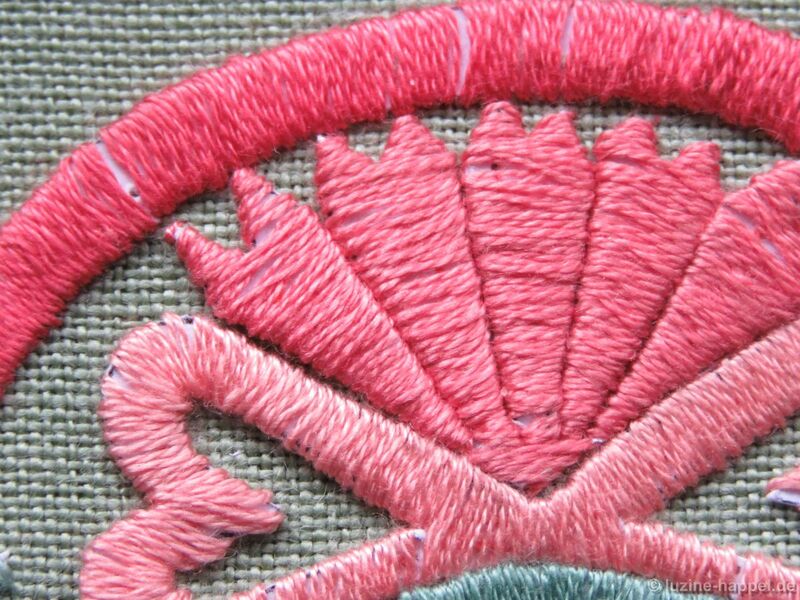 Afterwards, all single sections that I wanted to embroider were fastened to the ground fabric and then covered with densely placed stitches. stranded cotton (Anchor 875, 876, 1022, 1023, and 1024). 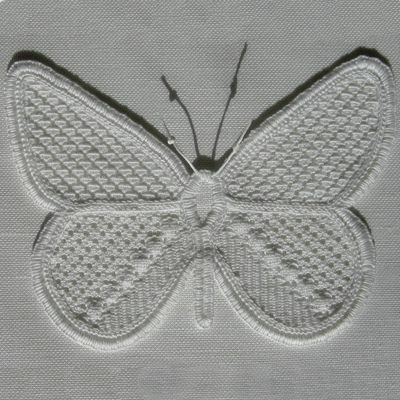 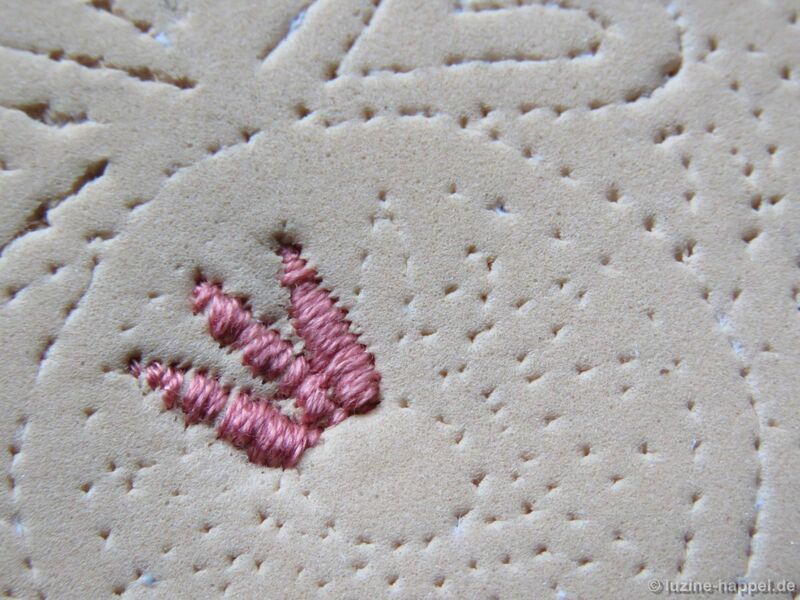 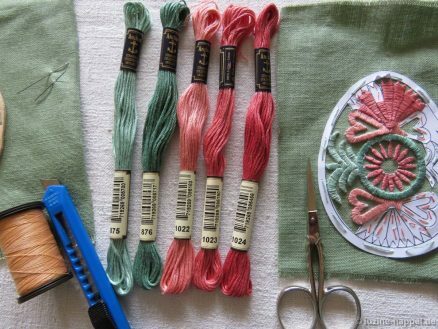 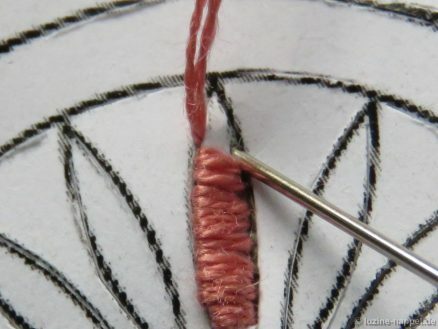 Using 2 strands of the 6-ply stranded cotton, the sections of the templates were embroidered along the cut lines in two steps – using a stabbing motion instead of a scooping motion. 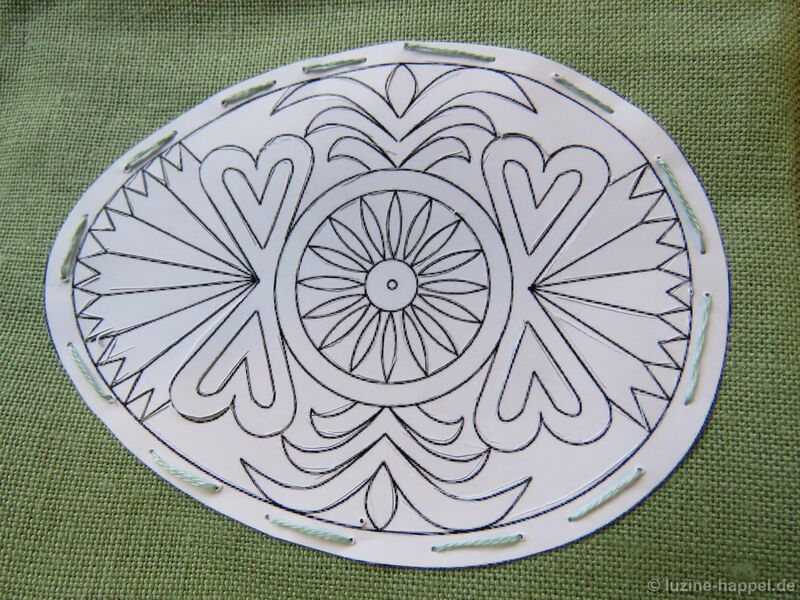 I thought this tedious. Through my experimenting, I figured out that it is much easier to first withdraw the paper sections that will not be embroidered. 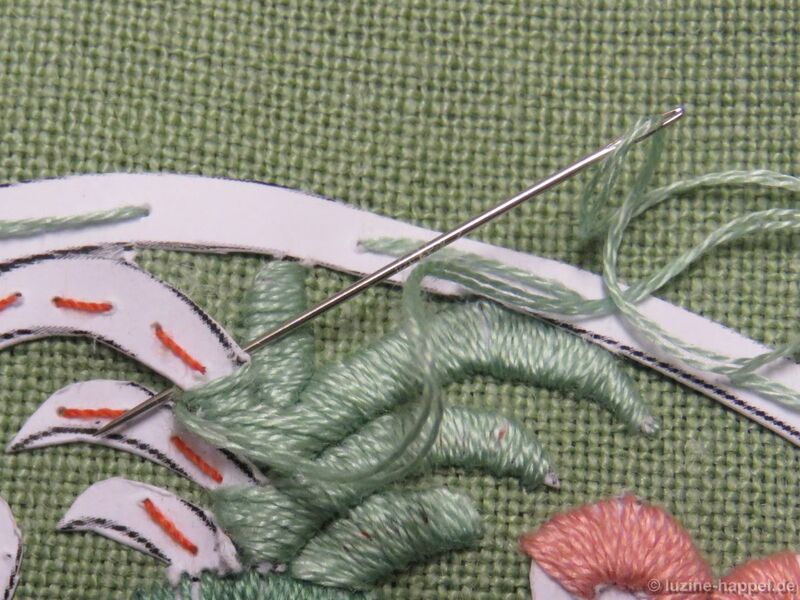 In that way, it is much easier to embroider the remaining sections. 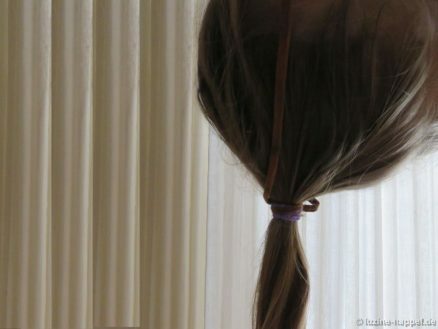 In the end, I was passably satisfied. 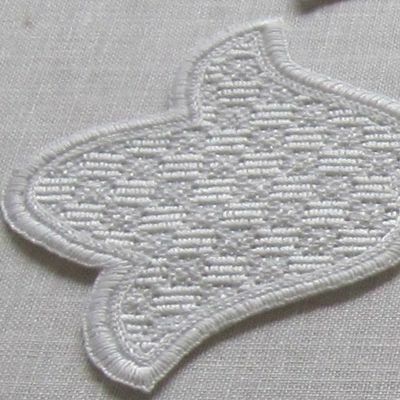 The single design sections are clearly distinct, but some of the stitches should have been worked more densely. I liked the cut out egg decorated on a light ground more. And so a second attempt was begun. 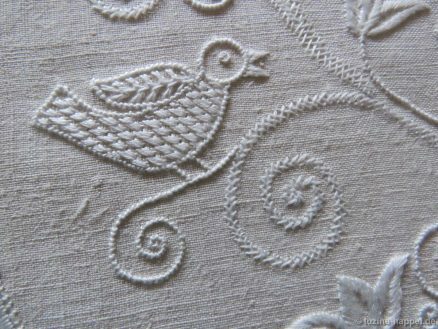 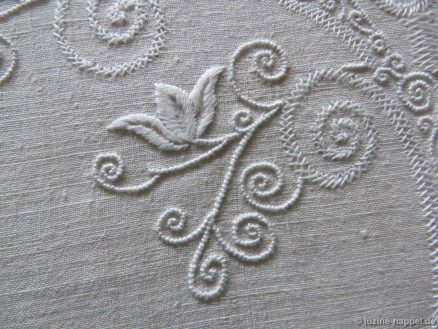 The design was transferred to natural linen using an iron transfer method. 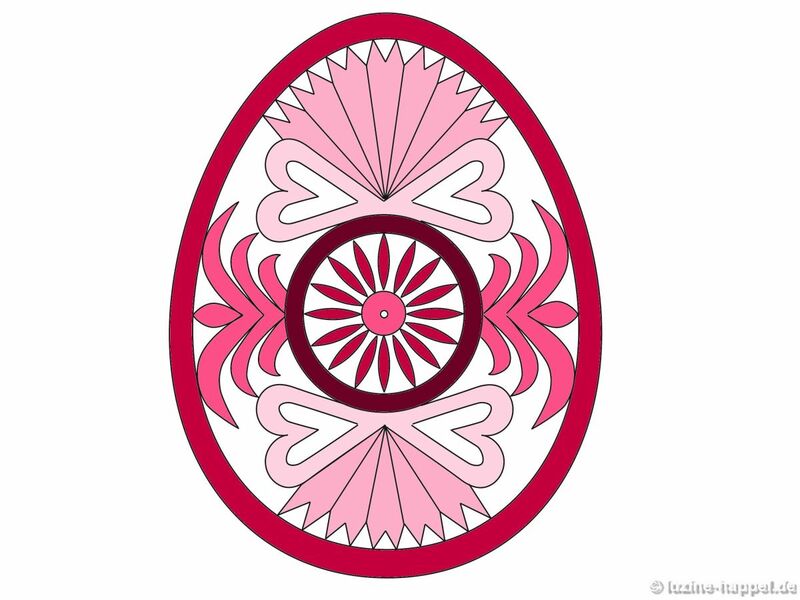 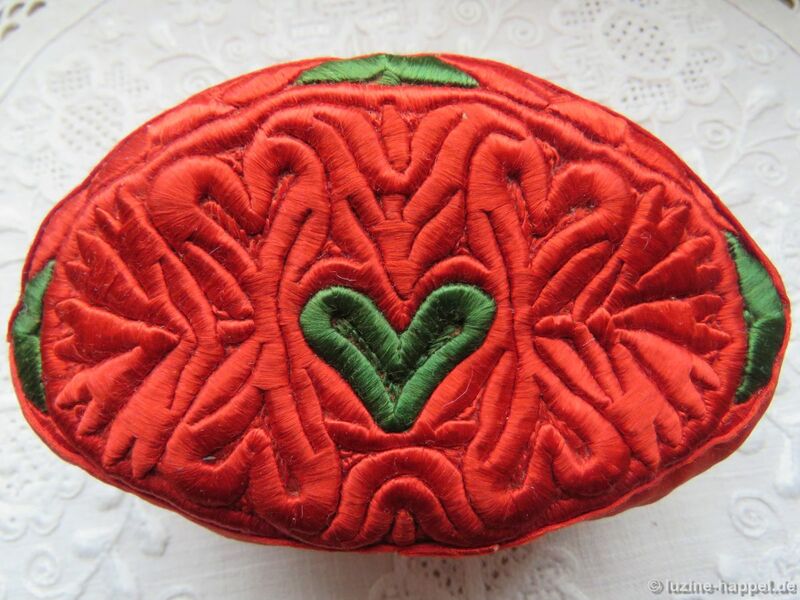 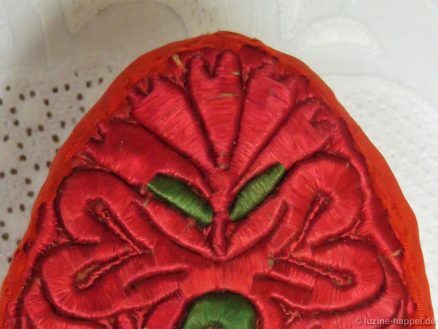 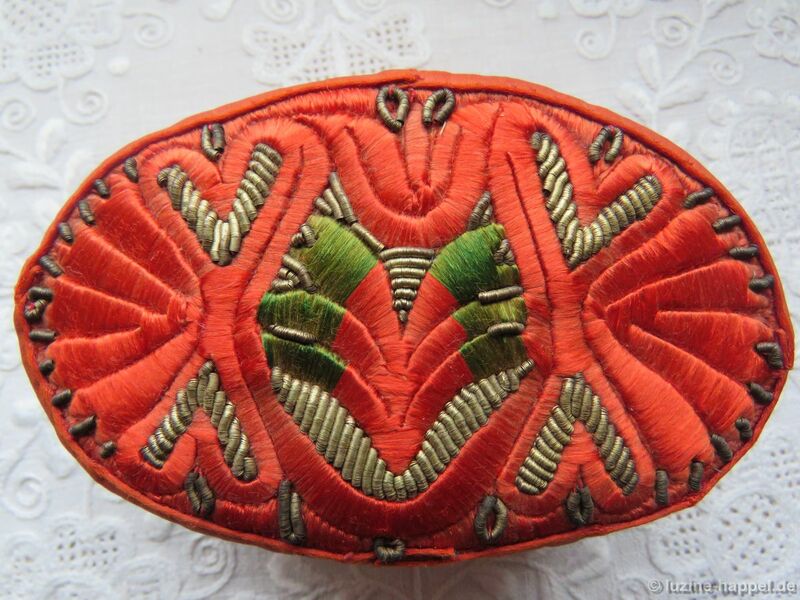 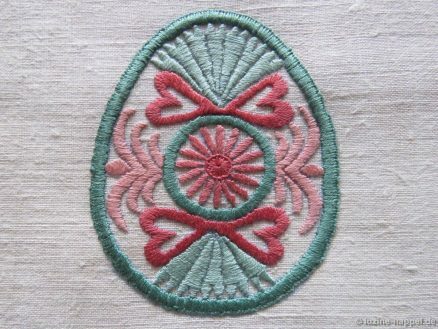 It was embroidered in the style of the Schwalm crowns with the same colours as the first egg but in a different layout. 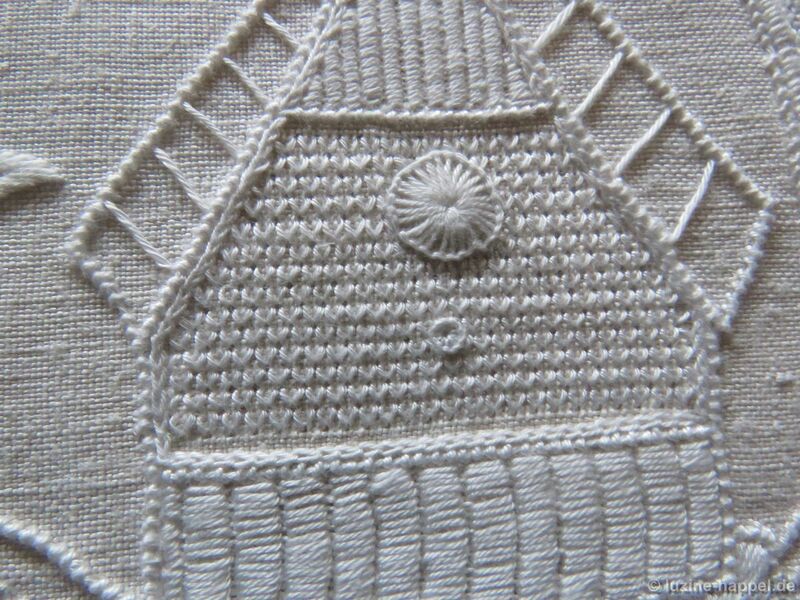 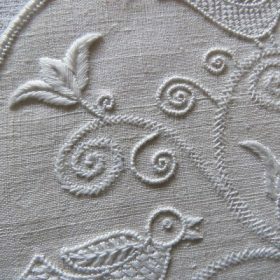 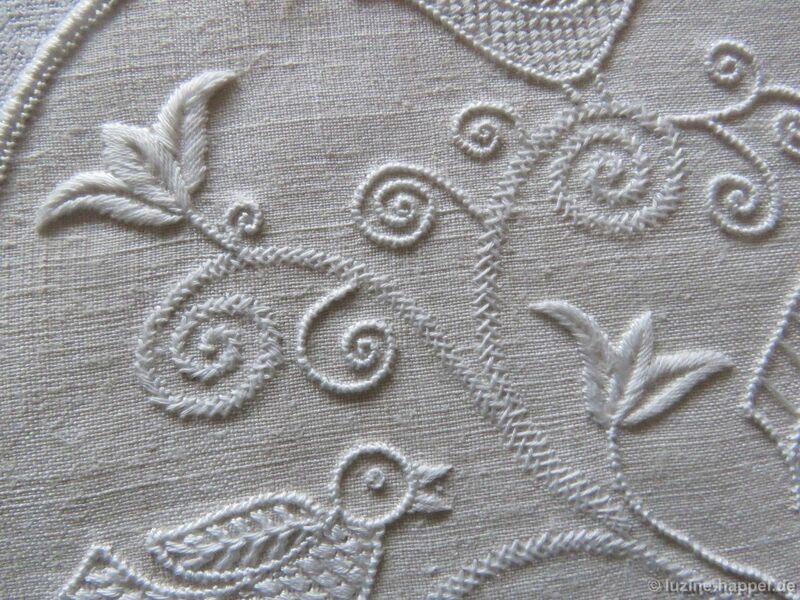 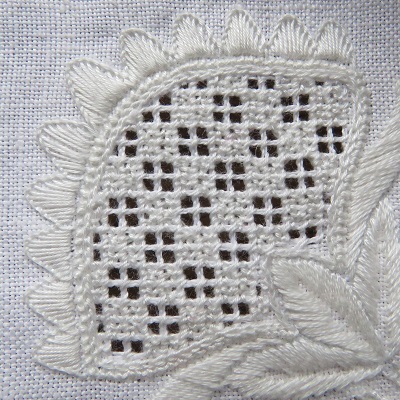 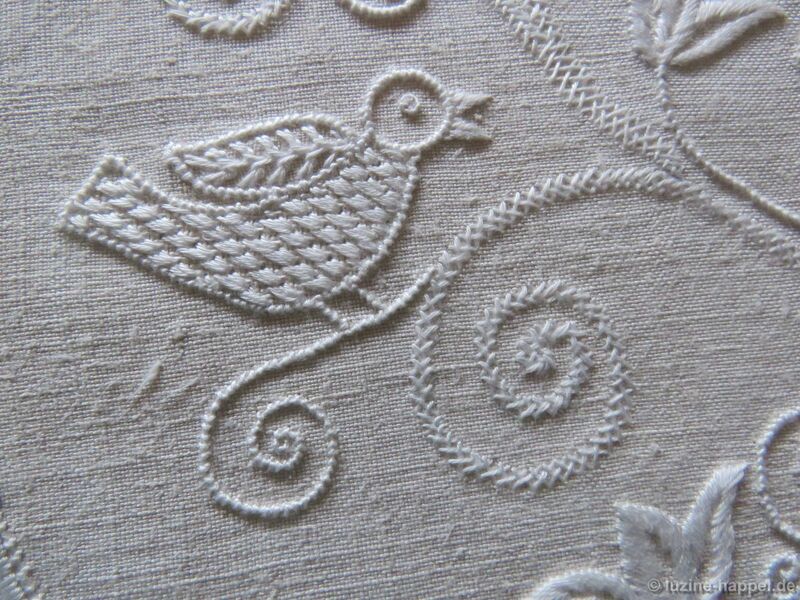 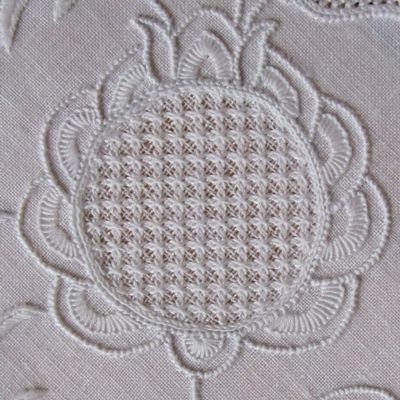 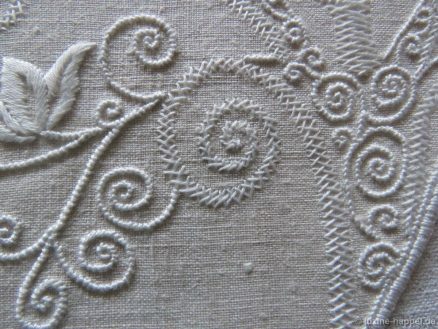 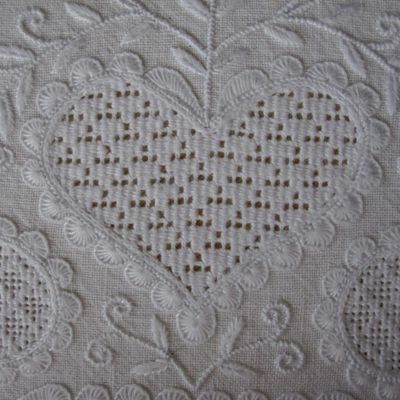 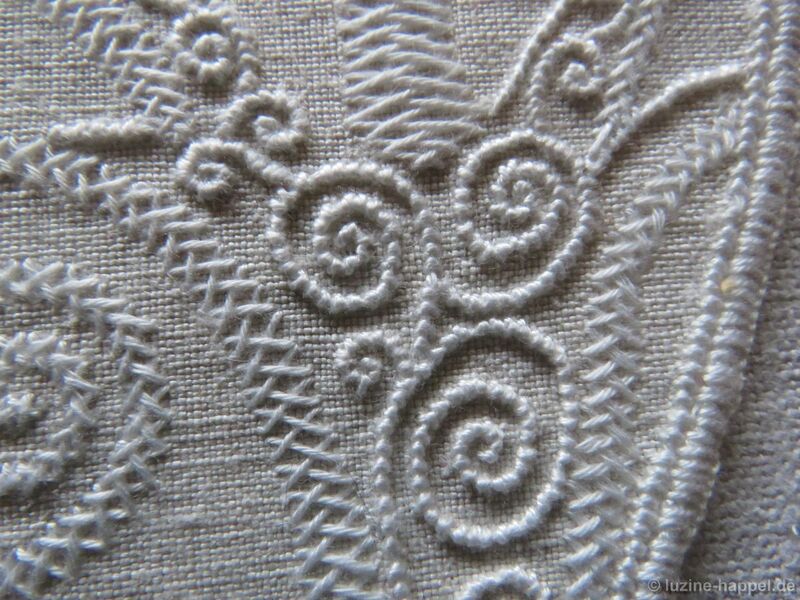 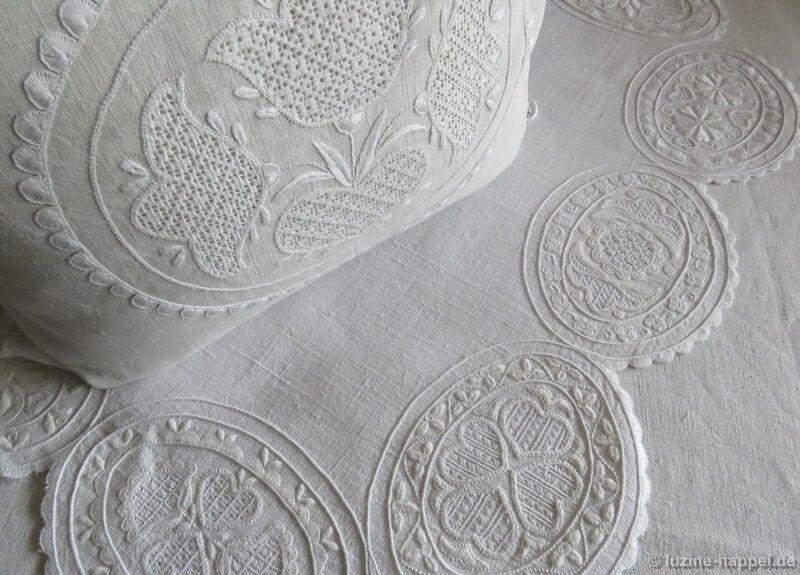 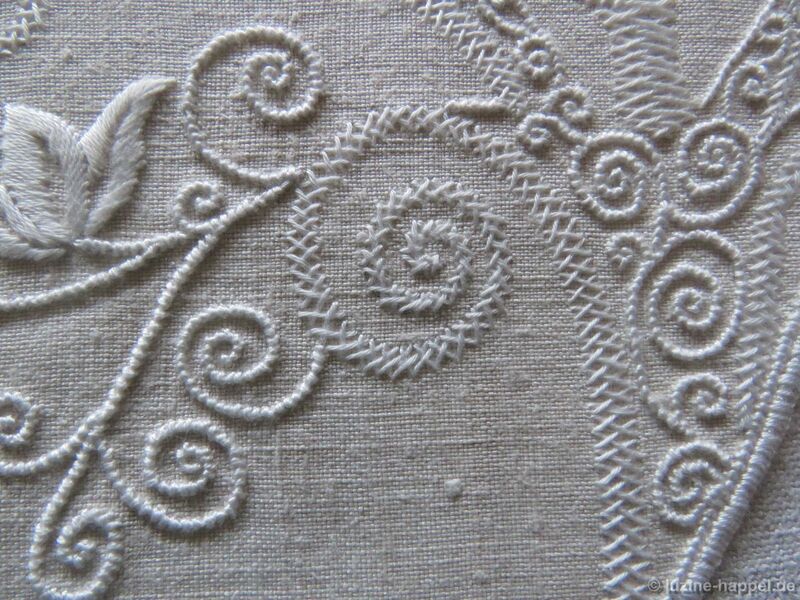 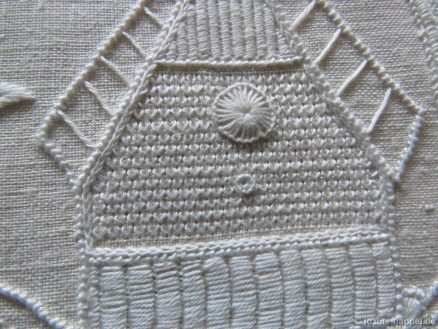 On the fine densely woven linen, the stitches could be placed closely and exactly together. 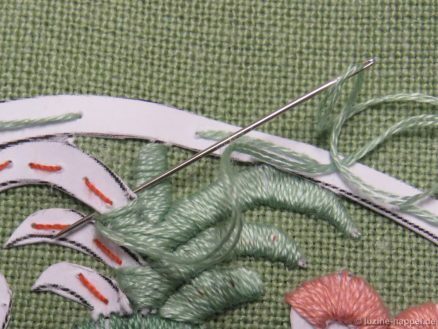 Embroidering this way was less tedious and much faster. 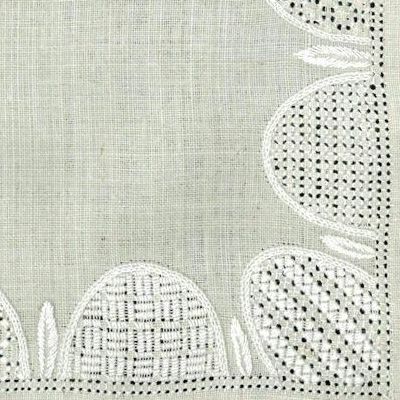 But in comparing the two examples, the one stitched upon the template is more dimensional and is much more distinct. 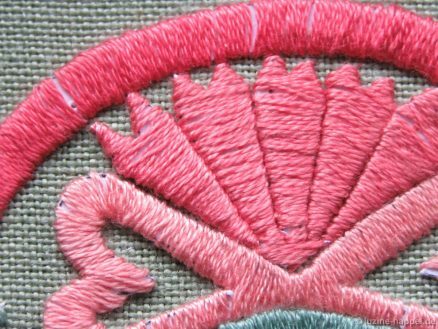 So, at the next opportunity, I will begin a third attempt making a paperboard template in the way Schwalm people used for colour embroidery. 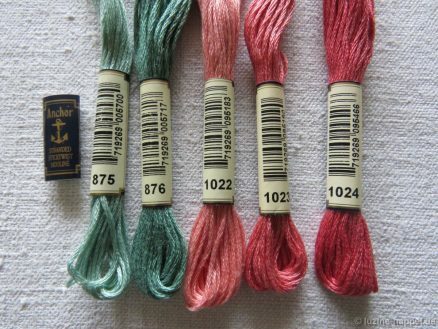 And I will use silk threads. 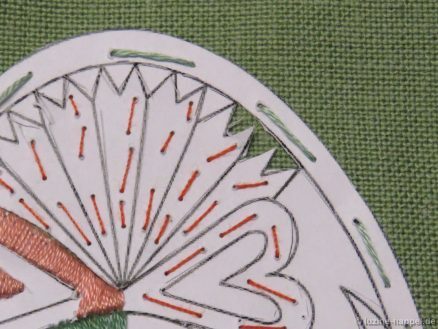 I find the siena colours from the Werkstatt für historische Stickmuster fairly good. 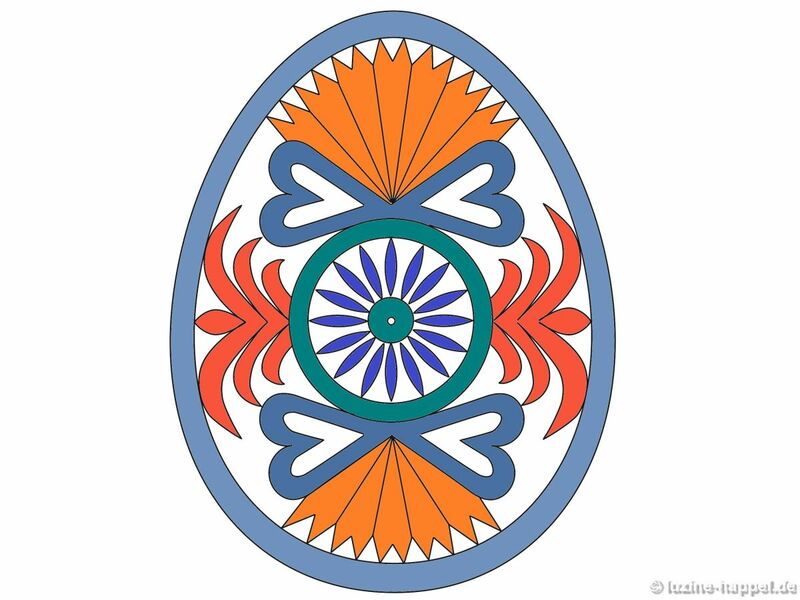 With other colour combinations, one can achieve – as the following drawings show – totally different effects. 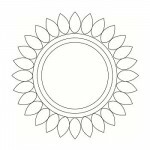 Please give it a try using your own favorite colours; I look forward to seeing your results. 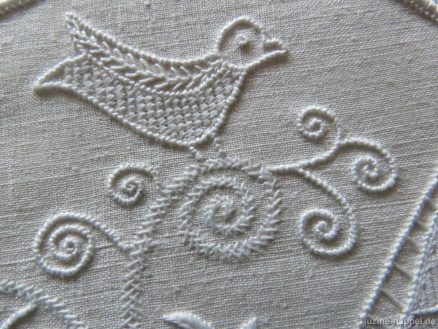 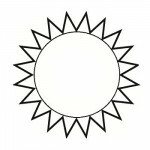 Drawing on the rich designs found on cap bottoms as inspiration, I asked the designer Christa Waldmann to draw outlines for whitework; she created some beautiful designs. 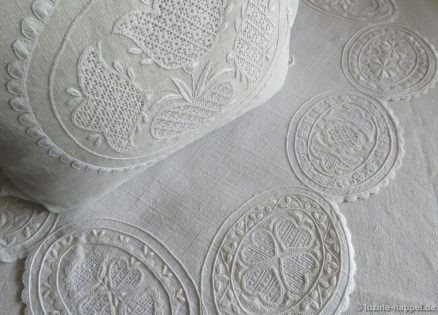 a nice pillowcase and my favorite piece, a fancy tea cloth with scalloped edges. Of course there are many other possible layouts for gorgeous Schwalm projects. 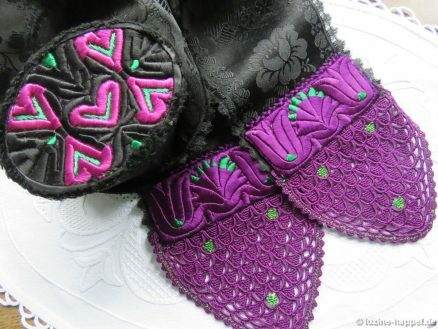 I am so happy with these special designs, and I think you will be, too. 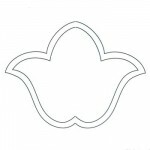 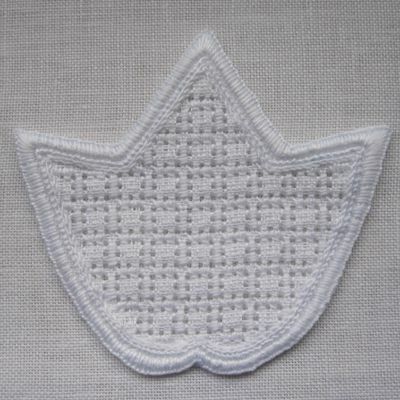 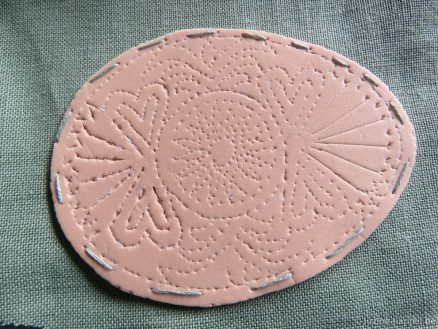 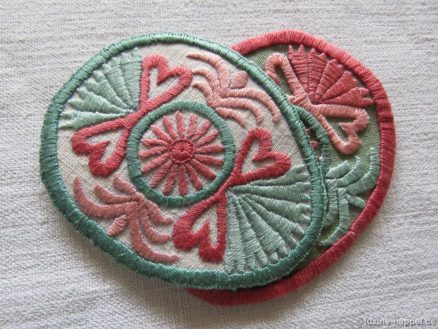 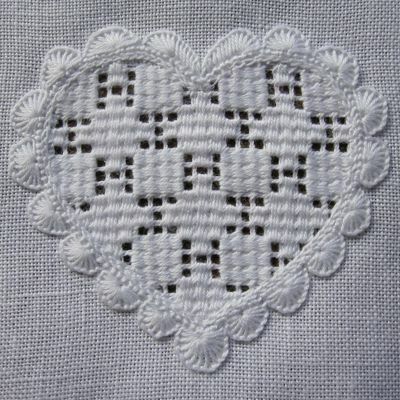 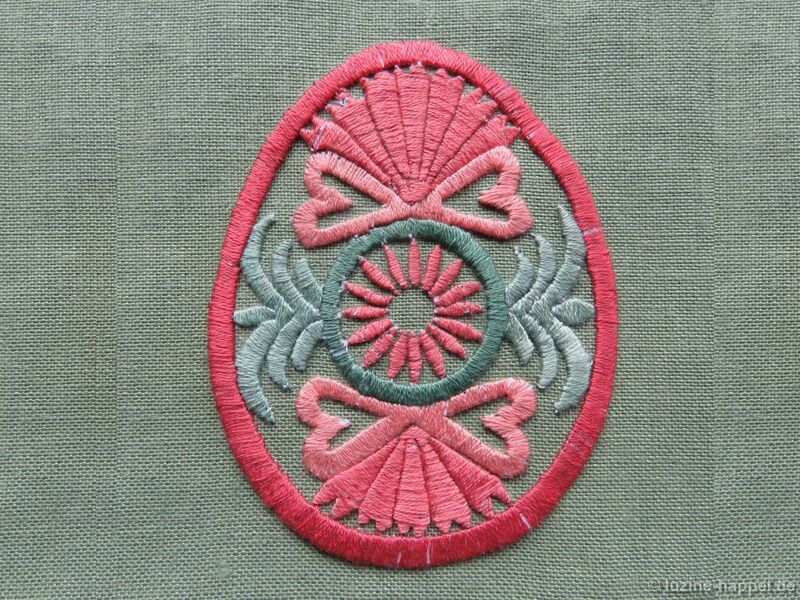 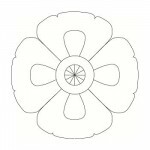 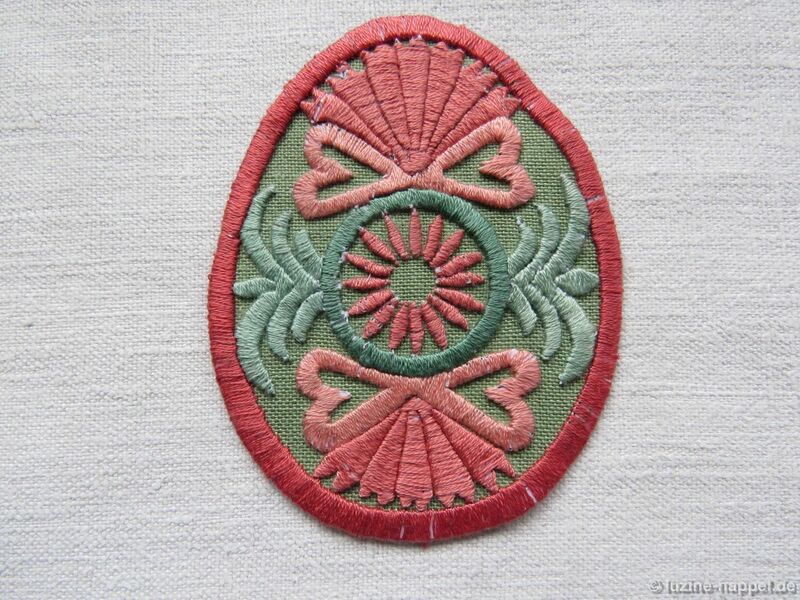 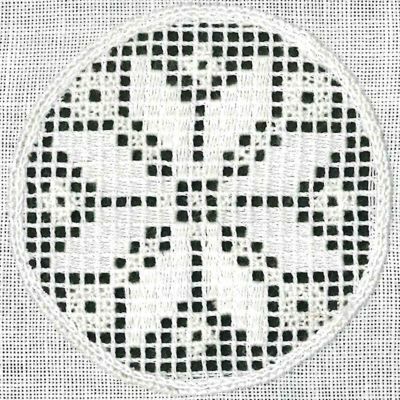 Same size ovals with scalloped edges in five different point symmetric designs; includes five pictures of embroidered examples. 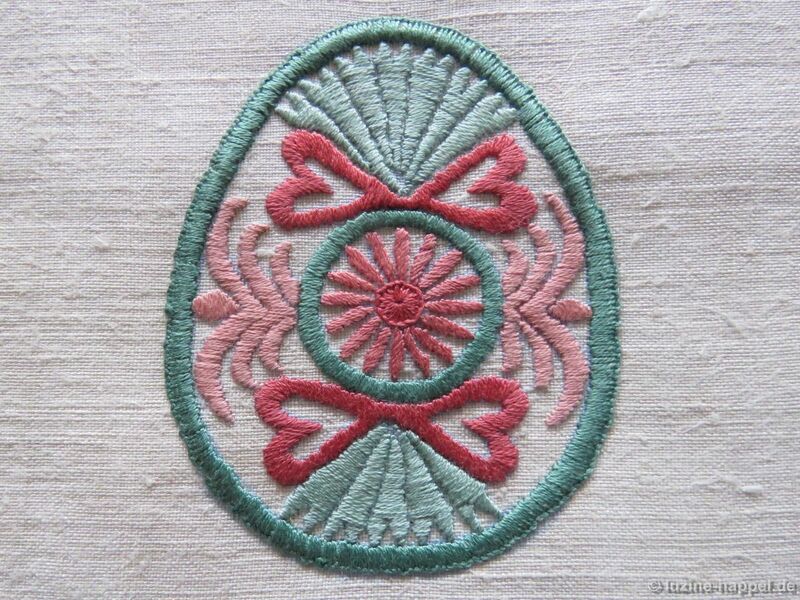 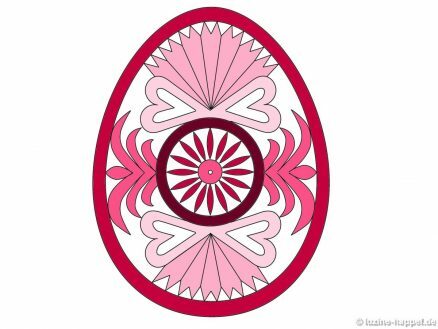 Same size simple ovals in eight different axially symmetric designs; includes one picture of an embroidered example. 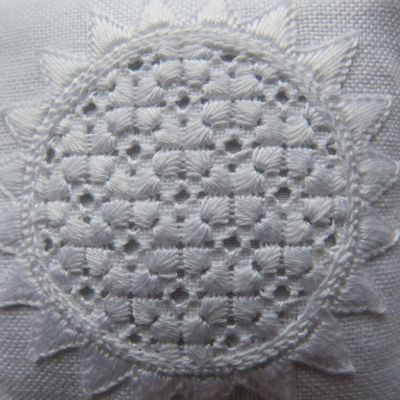 Same size ovals with scalloped edges and fancy edge borders in six different point symmetric designs with eighteen variants in all; includes six pictures of embroidered examples. 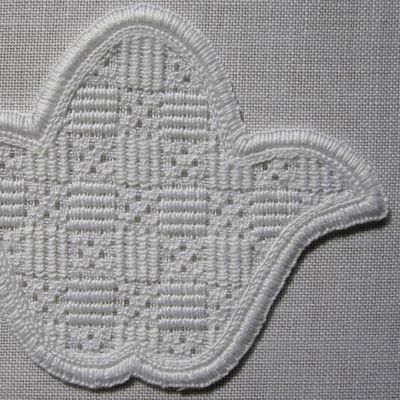 Same-sized ovals with scallop edges in five different point symmetric designs and in addition five pictures with embroidered examples. 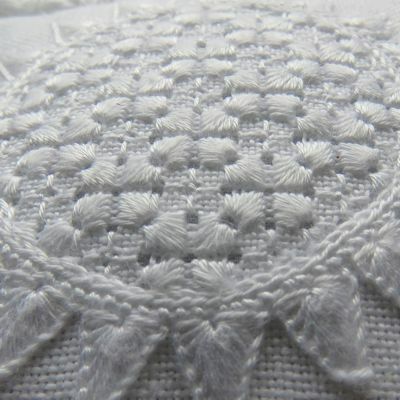 Same-sized ovals with scallop edges and fancy edge borders in six different point symmetric designs with eighteen variants in all and in addition six pictures with embroidered examples. Schwalm women wore little caps to match their festive costume. 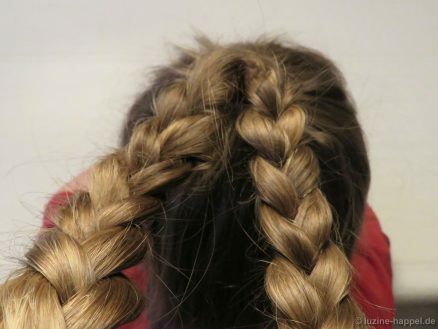 The little caps were placed over the hair knots. 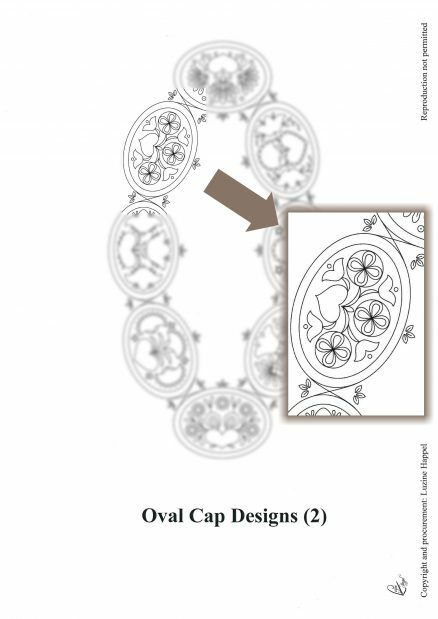 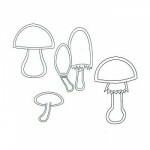 The little caps had different sizes depending on the wearer: child, adult, or woman with an especially magnificent head of hair. 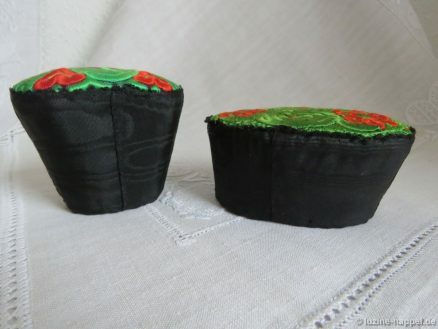 The little caps were primarily flat and wide; later they became more and more tall with the sides tapered down to a smaller opening. 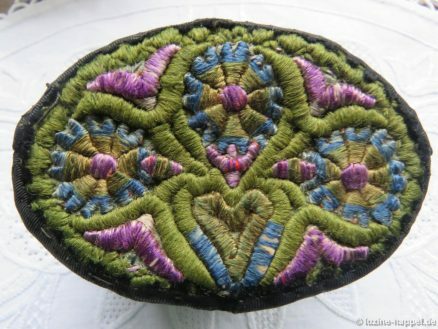 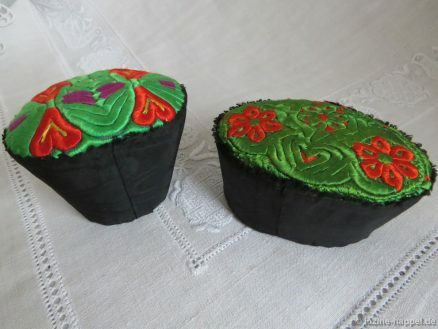 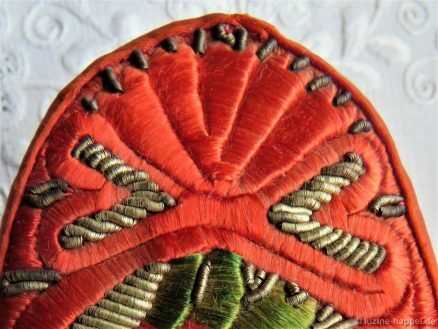 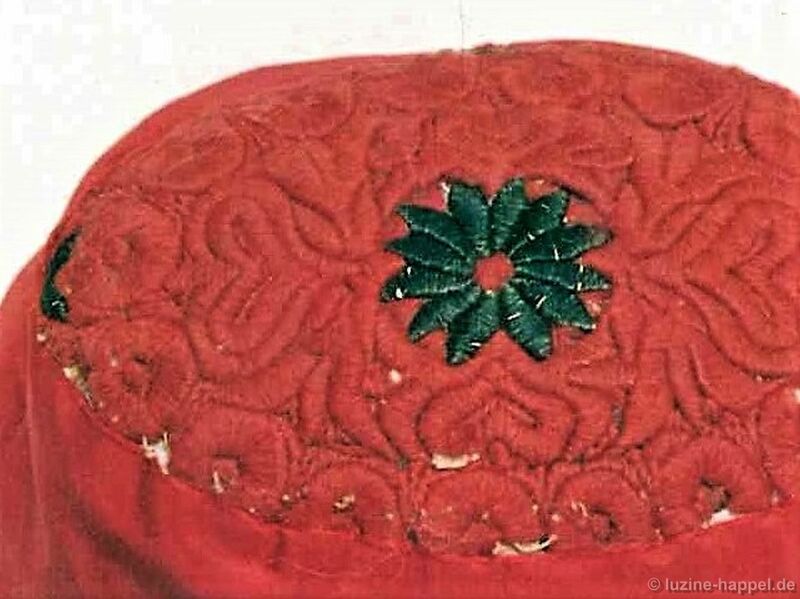 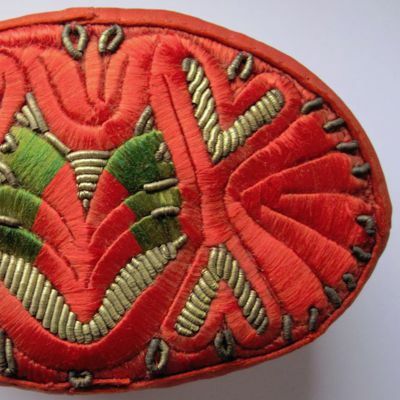 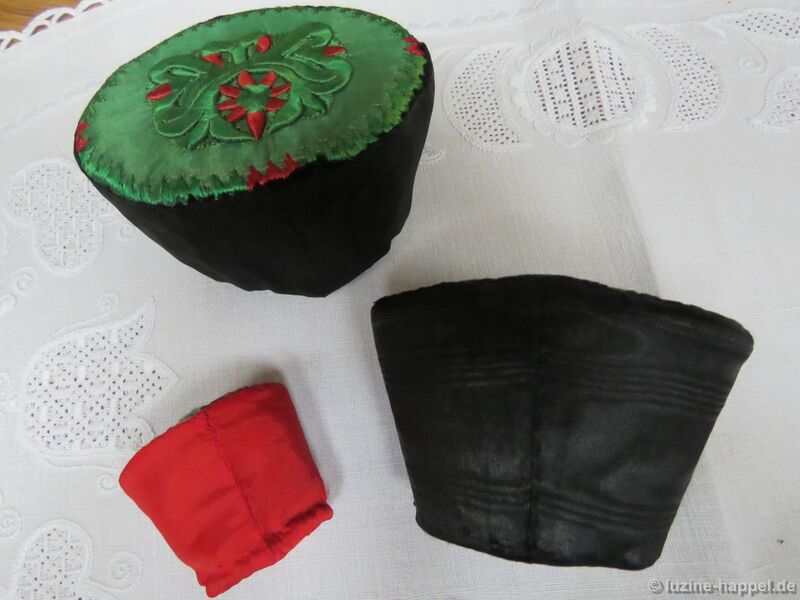 The bottoms of the caps were elaborately and usually colourfully embroidered. 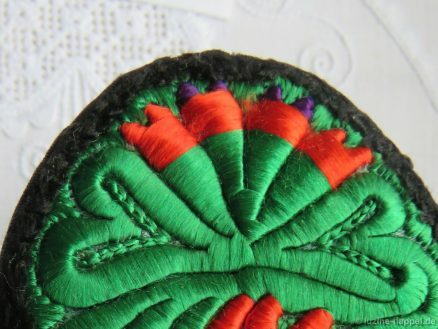 The colours always matched the colour of the costume – red, green or blue (purple). Many artistic designs came from the template maker. 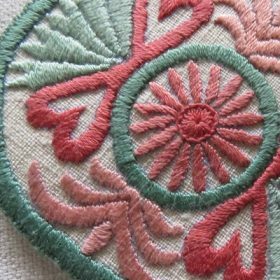 Perfectly crafted templates were primarily covered with colourful embroidery using fine woolen yarn; silk threads were used later. 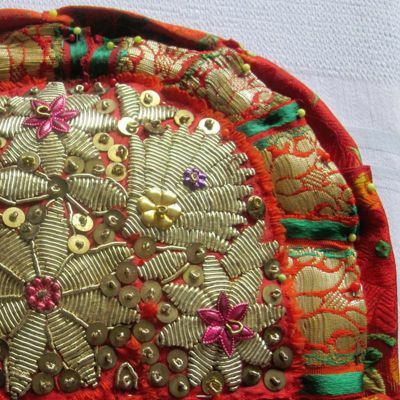 Much later, gold and silver bullion and sequins were added. The older, somewhat wider caps were usually additionally decorated at the edges with narrow single templates, which were also finely embroidered. 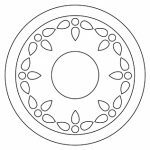 Drawing on these rich design arrangements as inspiration, I asked the designer Christa Waldmann to draw outlines for whitework. 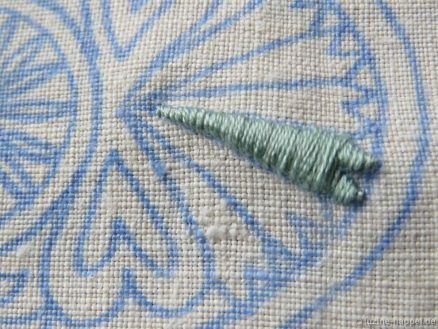 Look forward to seeing the beautiful results next week. Each cap had matching (in colour) cap bands, the Kappenschnüre. The ends of these cap bands were made very differently – this is a subject of a future article. Schwalm girls and women wore their hair long without a fringe (bangs). 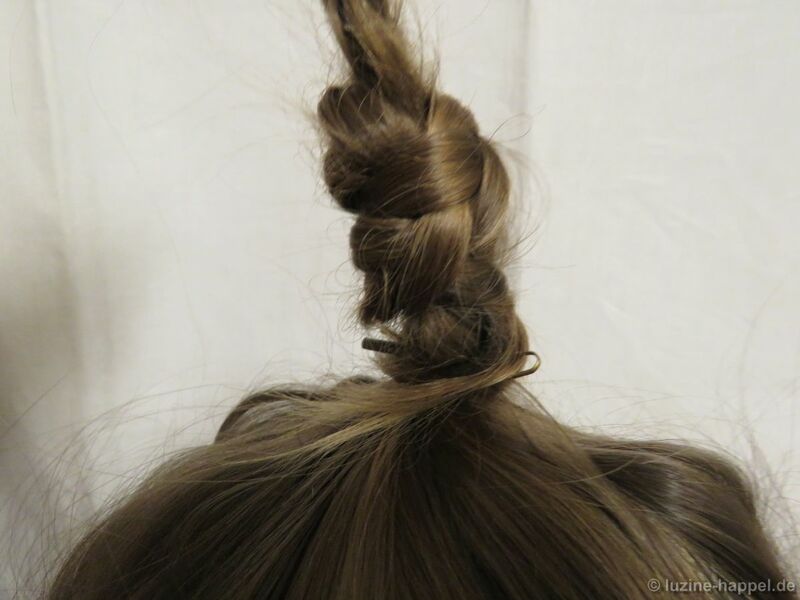 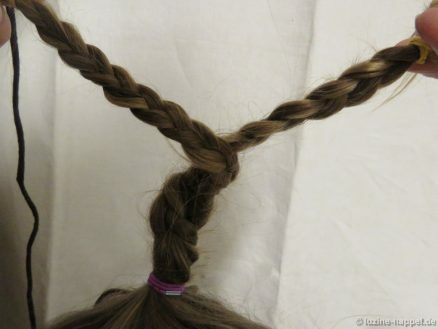 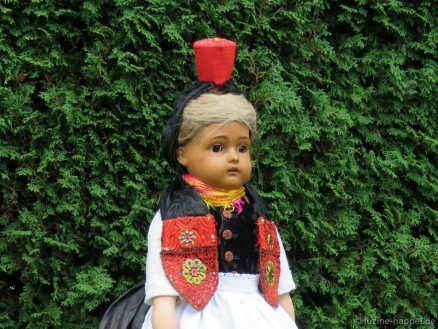 The hair was styled into a knot, which in the Schwalm is known as Schnatz. 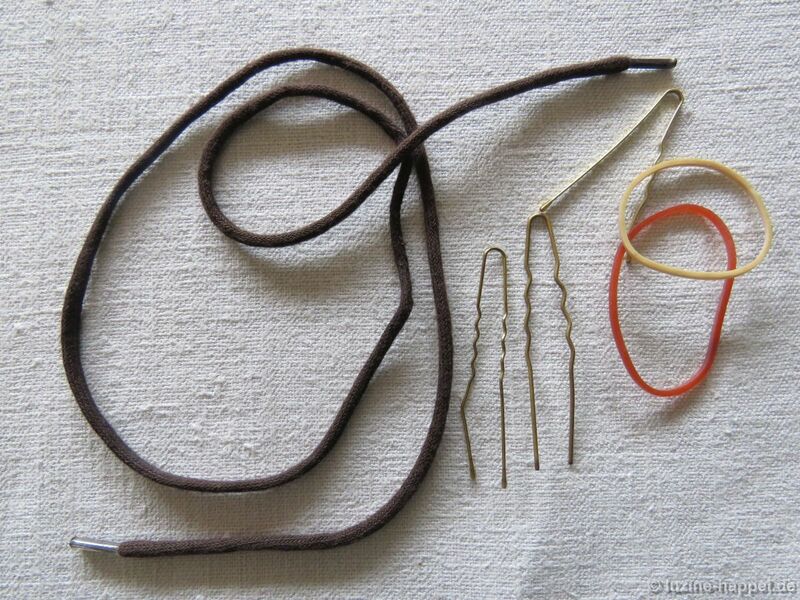 To create such a hairstyle, women needed certain accoutrements: a long, thin band or cord (like a shoestring), rubber bands, and some hairpins. 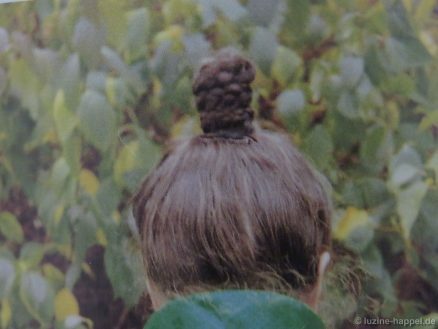 The hair was combed from all sides and pulled firmly upward to be bound on top of the head. This is easily achieved by quickly throwing the head downward. The hair was divided into two plaits. The band was worked into one of the plaits. 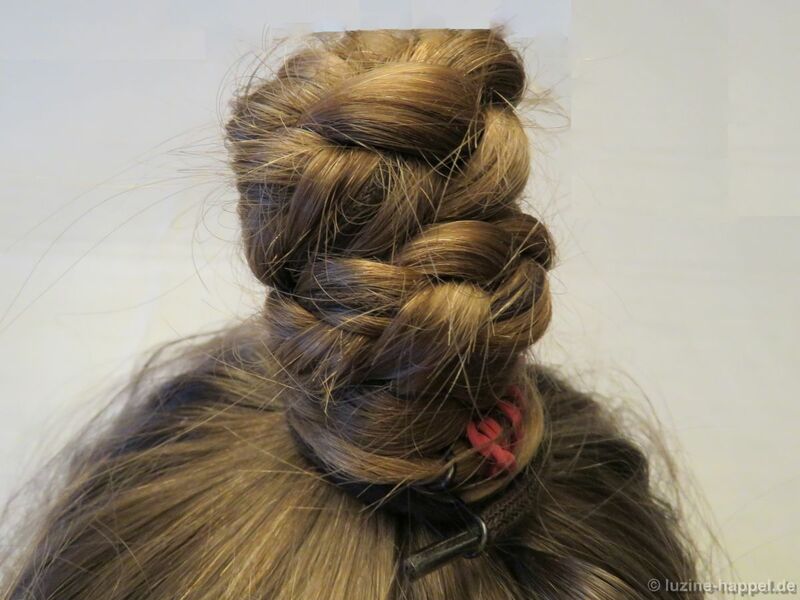 Both plaits were twirled up from the head as high as the finished knot should reach. One of the plaits (the one with the band) was held up while the other was wrapped downwards around the twirled part and fastened at the head with hairpins. Now the second plait – the one with the band – was wrapped around the established knot. 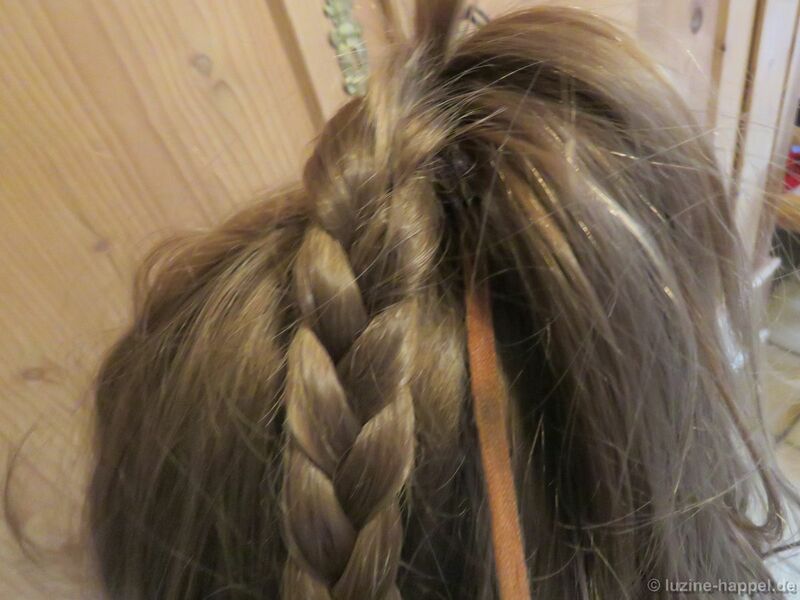 Because the band is longer than the plait, it is wrapped around the bottom of the knot and fastened with hairpins. 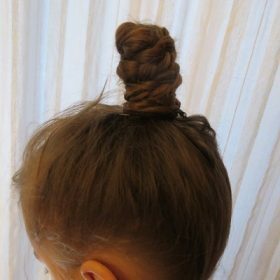 With some practice a perfect and fancy hairdressing was achieved. 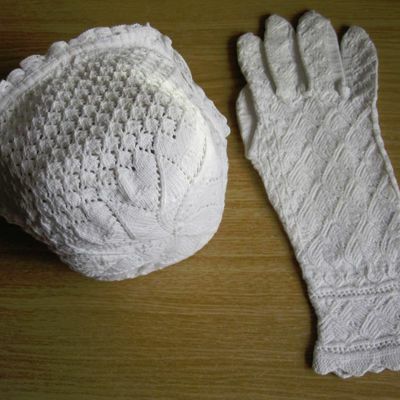 It was placed on top of the head, approximately in the middle between the ears. 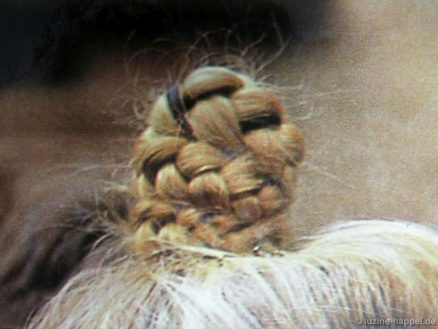 The Schwalm women needed this somewhat curious hairstyle to be able to wear their special headdresses. 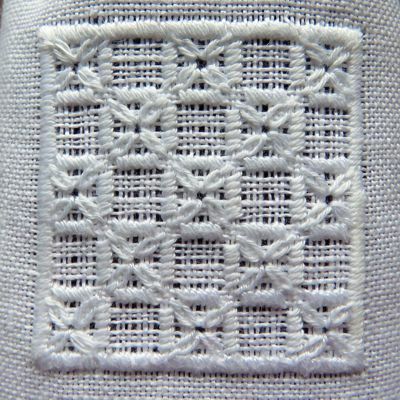 The little caps were placed over the knots. 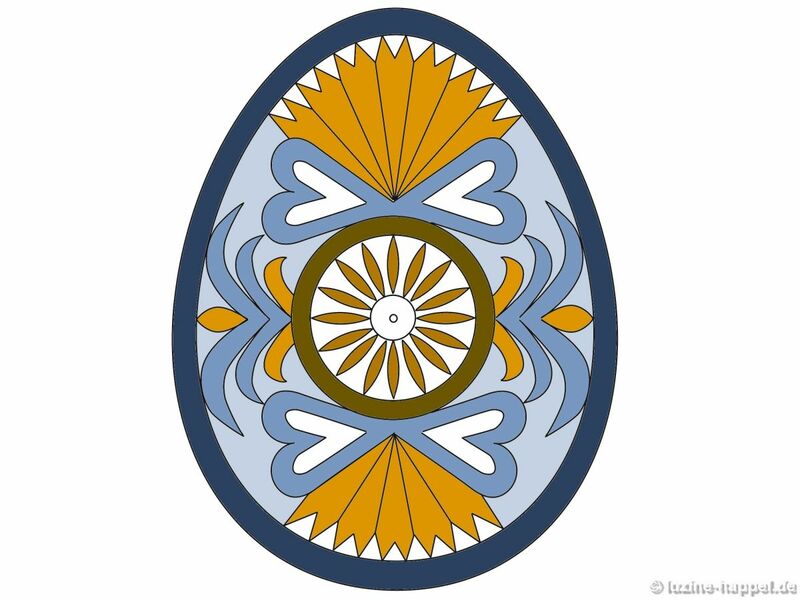 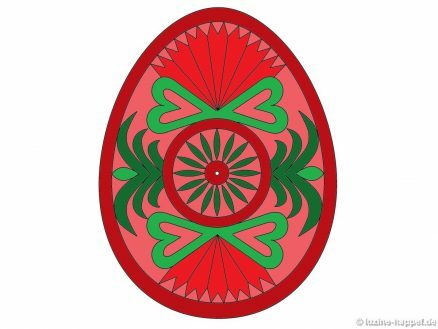 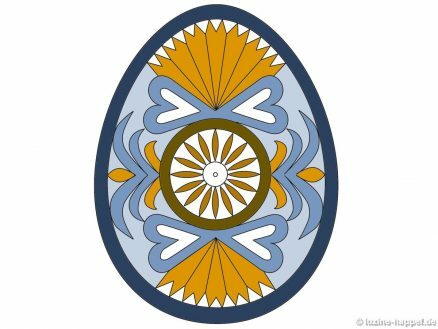 The artist Gudrun Hartwig created an extravagant, interesting, and spring-like design within an egg shape. 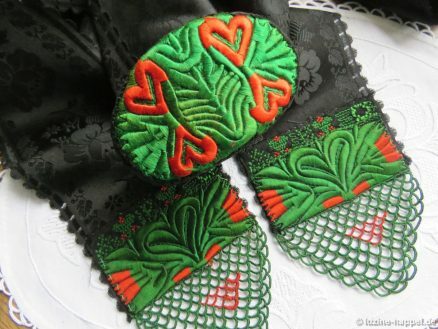 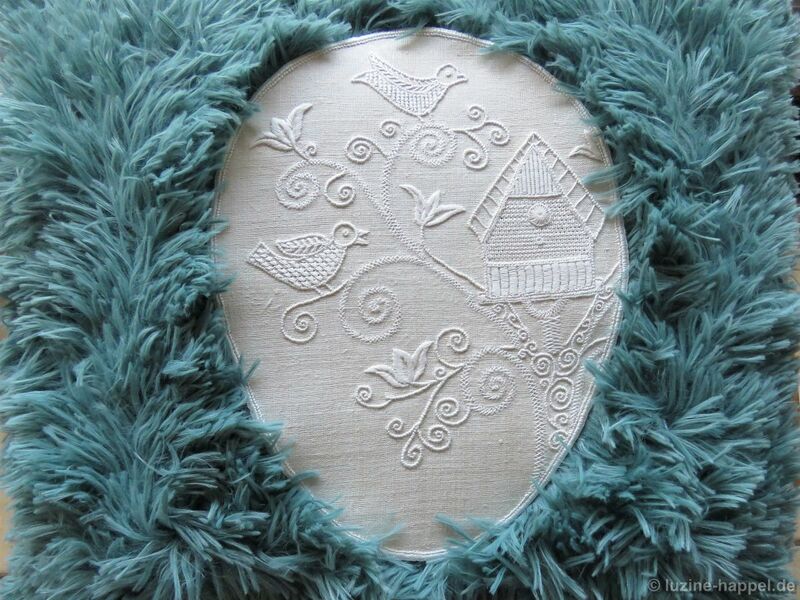 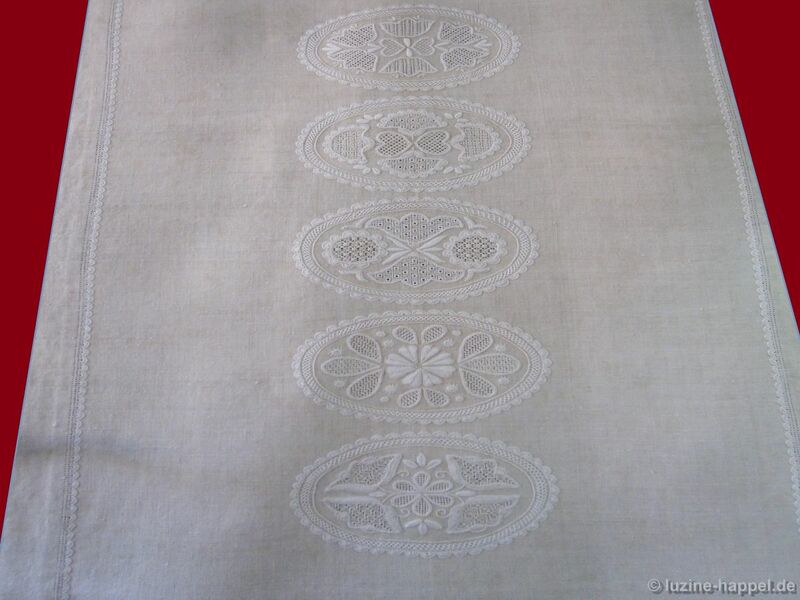 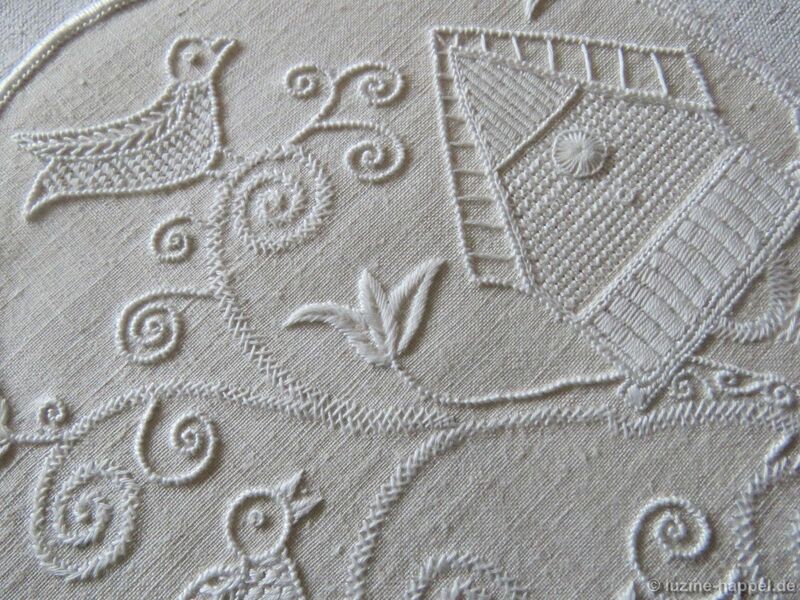 Here a pillowcase is decorated with this embroidery. 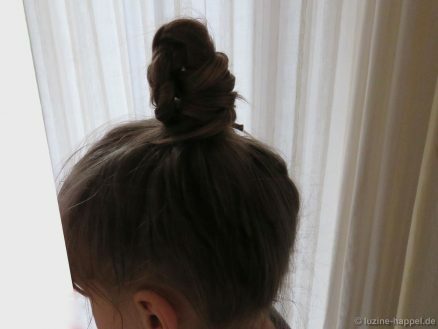 sprout out of the tree. 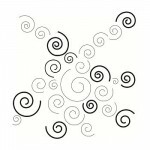 They show the power and beauty of nature awakening. 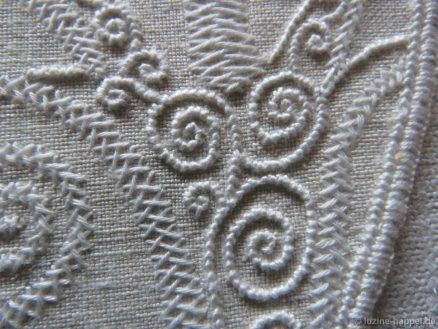 It is an extravagant design that guarantees both fun in the embroidering and plenty of room for practicing different stitches and stitch elements like tendrils, forks, and eyelets.